Most climbers attempt scaling Mount Everest during April or May. Ascending the highest peak in the world is a challenging undertaking. While more than 4,000 people have successfully conquered the mountain, around 250 people have died trying. Only experienced, fit, properly equipped climbers should even attempt the summit, and then only with the help of an experienced guide. Additionally, you must have the financial wherewithal to embark on the journey, which is likely to cost $50,000 or more. Everest veteran, Ralf Dujmovits recommends that climbers should be “very, very fit” before attempting to scale the 29,029 feet to the summit. The climb’s last 3,000 feet or so are known ominously as the “death zone,” as oxygen levels drop precipitously at this height. From this point forward, the climb only gets harder as your body has trouble fueling it's metabolic fire. Some climbers use oxygen tanks to help them endure the last leg of the climb. Mount Everest is not suitable for beginning climbers. Before undertaking the challenge, climbers should have several trips under their belts, including a few summits of 26,000 feet or more. Climbers intent on climbing Everest must already be proficient at all basic climbing skills, staying warm in sub-zero conditions and enduring the prolonged mental challenges associated with such attempts. Reaching the top of the world requires more than a pair of climbing shoes and a winter coat; trying to get by with insufficient or substandard equipment invites disaster. With average summit temperatures ranging from -4 to -31 degrees Fahrenheit, frostbite awaits climbers who do not don appropriate apparel. Additionally, you will need an ice ax, crampons and standard camping gear, such as a tent, sleeping bag and camp stove. 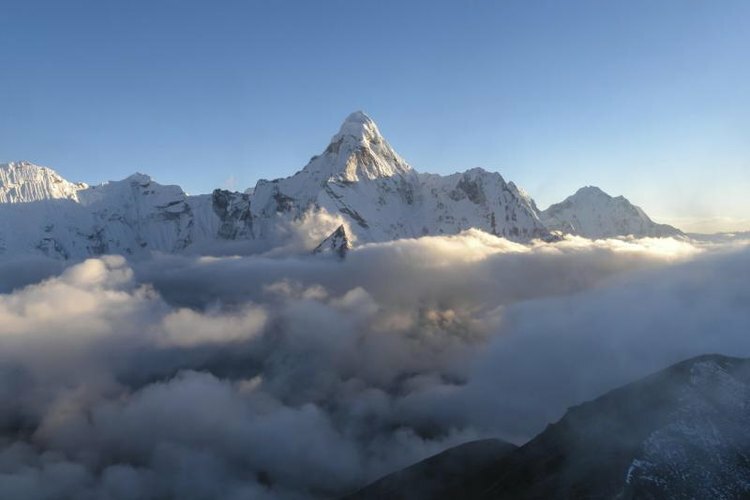 The first step in climbing the mountain is obtaining permission from the Nepalese government to do so. This requires a climbing permit, which will cost at least $10,000. Additionally, you cannot climb Everest alone; in addition to the other climbers in your team, several Sherpas – who help to carry your gear -- and at least one guide should accompany you up the mountain. Climbers can take a variety of routes to the summit. Most climbers spend about five or six weeks at base camp, acclimating their lungs to the altitude. From this point, they take one of several established routes to the top. While you can choose from any of 18 named routes up the mountain, most climbers opt for the North Col route or the South Col route. The southern route is safer for beginners, features warmer temperatures and calmer winds. The northern route is less crowded, but colder and more dangerous, as helicopters cannot perform rescues on this route. As of 2010, the north route had claimed nearly twice as many lives as the southern route. Popular Mechanics: Why Does Everyone Climb Everest in May?